Dr. Rita Goldstein delivers keynote speech on neuroscience of drug addiction. June 15, 2017. “Red…green…blue…yellow” the crowd chanted. They had been instructed to shout the colour of each word written on the screen, as fast as possible. However, the colour and the words did not match; on a slide at the front of the auditorium was the word “BLUE” written in red, the word “YELLOW” written in green, and so forth. The struggle was audible, the chanting slightly out of sync as audience members tried to block out the content of the words. This task demonstrated the well-known Stroop effect; it is much easier to read out the colour of a word when its text and colour do not clash. When the two are different, we take significantly longer to read out the correct colour of the word. Reading comes more naturally and automatically to us than naming a colour, which takes more mental effort. Because we automatically read the text before we try to name the colour, we experience a delay in reaction time, as our brain struggles to suppress what we read. This phenomenon is known as interference. The colour-shouting audience consisted primarily of graduate students participating in the second annual Neurosymposium, held at the Bibliothèque et Archives nationales du Québec in Montreal. It was a one-day conference, providing opportunity for students to share their cutting-edge brain research in a relatively informal setting. The theme of the event was the role of neuroscience in society, with a focus on applying new discoveries to clinical treatments. The event’s keynote speaker was Dr. Rita Goldstein, a professor of Psychiatry and Neuroscience at Icahn School of Medicine in New York City. The Stroop effect experiment was a part of her keynote talk on the neuroscience of drug addiction. She explained how an altered version of the Stroop effect was used to study addiction in her research. “You’re not off the hook yet”, she joked. She instructed the crowd to identify the colour of the words like the first experiment, but with words that were drug-related. “HIGH” written in green, “PIPE” in red. The second, altered version of this task has been used in Dr. Goldstein’s research to show how people addicted to cocaine process drug-related words differently than people who are not addicted. Research participants with drug addiction performed this task in an fMRI brain scanner, and were found to perform better than controls on the task. The scanner also revealed that individuals with addiction receive a rush of dopamine, representing desire for the drug, upon reading out the colour of a drug-related word. The Neurosymposium aimed to bring together graduate neuroscience students from across the province to network, discuss, and present new ideas, fostering a Quebec-wide collaborative neuroscience community. Unlike a standard neuroscience event, this inter-university student-led project was “horizontal” in nature, meaning it consisted mostly of students presenting to other students. This provided the unique opportunity for young researchers to share their knowledge with like-minded students from different schools. Presentations were quick and topically diverse, with students sharing novel research into pain, language, eating habits, autism, epilepsy, and even American voting habits. Neurodegenerative diseases such as Alzheimer’s, Parkinson’s, and Huntington’s were also the focus of several talks. The event was organized by students in McGill’s Graduate Student Association for Neuroscience (GSAN), along with the graduate societies of other schools in attendance. Participants included delegates from Université du Québec à Montréal (UQAM), McGill, Université de Montréal, Laval, Sherbrooke, Concordia, as well as researchers from as far as Trois-Rivières and Outaouais. 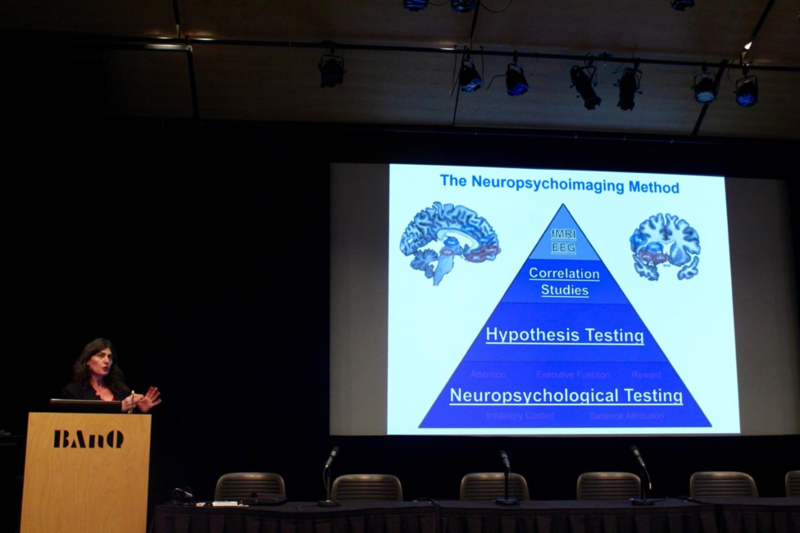 The Neurosymposium’s horizontal nature was intended to encourage greater collaboration among emerging scientists, and to allow brain research to progress faster through knowledge sharing. The conference was also open to numerous undergraduate students, who attended featured talks and individual presentations by graduate researchers. Interested parties were encouraged to explore a diverse range of neuroscience sub-fields through one on one discussions with researchers. “You get to network with people who are more experienced than you” said Noga Aharony, an undergraduate neuroscience student at McGill, explaining that these events can provide very valuable insight for students thinking about pursuing a graduate degree in the field. Dr. Rita Goldstein’s keynote on practical, neuroscience-based interventions for drug addicts highlighted the event’s primary theme: the relationship between neuroscience and society. The ideal intentions behind neuroscience research were debated during an early panel discussion. Some panelists agreed that scientific research should always be translational: research conducted with the intention of having practical uses to society. Others advocated for foundational research, done for the sake of research itself and for the expansion of knowledge. Proponents for translational research argued scientists have a responsibility to focus on research that will lead to the development of useful medical tools. They mentioned that the most beneficial research to society may not always be the study a researcher finds most interesting. Supporters of foundational research highlighted the importance of studying basic concepts with the primary goal of increasing our pool of knowledge. They emphasized that countless discoveries, from Penicillin to radioactivity, have been accidental. Scientists often make ground-breaking discoveries simply by following hunches and exploring their passions. In the end, panelists agreed that there is a place for both foundational and translational research in modern neuroscience. Research application is more important than ever, and translational neuroscience can help improve the lives of people living with a range of mental illnesses, including addiction. At the same time, foundational research is also important, as there is still much work to be done in understanding the fundamentals of the brain’s function. Even if they do not immediately intend to, these foundational studies can also lead to future applications. With many unique areas of study, neuroscience has become increasingly specialized. Researchers may dedicate their entire lives to studying one particular protein, or a single region of the brain. Today, researchers recognize that it is rarely possible to advance our understanding of the brain through individual efforts alone. Robin Sawaya, an MSc neuroscience student at McGill and an organizer of the event delivered a closing statement. “Collaboration is the future,” he stated, explaining that the stereotype of the lonesome neuroscientist toiling away in the lab is outdated. Modern researchers need to work together if they are to overcome the challenges posed by the deep complexity of the human brain. A recent emerging trend in the scientific world is “open science”: shifting focus away from competitive and private research, and towards the sharing of knowledge between labs and researchers for the sake of speeding up scientific progress. The Neurosymposium embodied this philosophy, encouraging collaboration, rather than competition, between schools. Interdisciplinary work is the key to scientific progress. Brain scanners rely on concepts worked through by physicists, devices built by engineers, and software developed by computer scientists. Successful treatment relies on scientific knowledge from researchers being translated into diagnostic tools for clinicians, and drugs from chemists and pharmacists. It is through collaboration within neuroscience and across other fields that scientists can hope to pave the way for a better understanding of the brain, and a healthier future.